LOVE Letters-Everything you need to know! Home » Latest News » LOVE Letters-Everything you need to know! Here at Solid State UK, we have our very own light up LOVE letters. Alongside them we also custom make whatever letters you want to suit your needs! Whatever you want to spell, we can do it; Mr & Mrs, initials, names etc. We have our LOVE letters in both 4ft and 5ft sizes! And our custom made letters only come in 5ft! 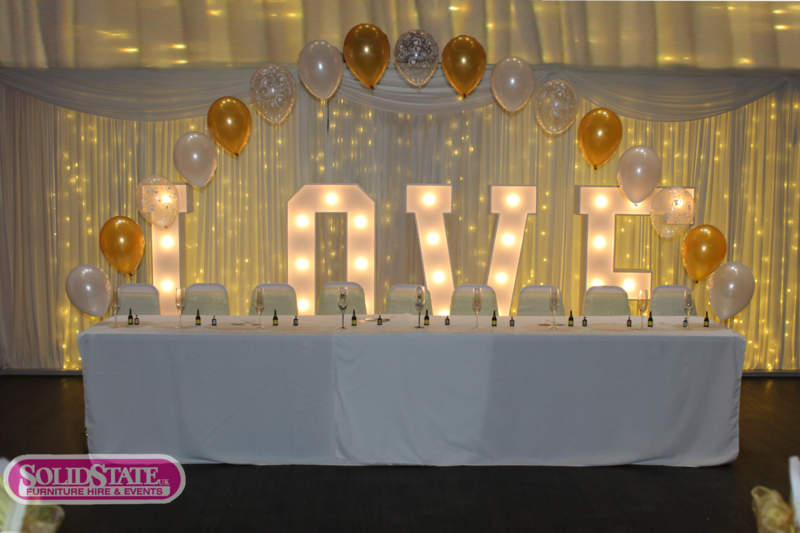 Despite the drop in size, our 4ft love letters have some benefits over the 5ft ones! Our 4ft LOVE letters have multiple modes that let them fade, flash, twinkle etc. As well as this, the brightness of the lighting can be totally controlled by you, unlike on the 5ft LOVE letters. The main advantage of our 5ft letters over our 4ft LOVE letters is their size! If you’re looking to make a statement these are the ones you should go for! They can be placed behind the main table and still be seen, they can be placed on a lawn and brighten up the area, there are endless possibilities! Alongside the other advantages of our 5ft letters we also do the 5ft variety in any letter of the alphabet, so if you’re wanting to spell anything other than love, the 5ft type are the ones to go for! We can spell out pretty much anything so give us a call today to see what we can do for you! 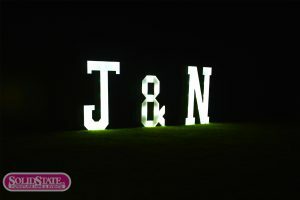 Take a look at some of our light up letters in use!